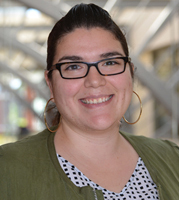 Dr. Fernández is an Assistant Professor in the Department of Educational Leadership. She is a former bilingual education teacher whose primary research is focused on centering, listening to and sharing the educational engagement experiences of Parents of Color, particularly those of Spanish-speaking Latin@ immigrant parents living amid threatening and hostile anti-immigrant environments. Critical Race Theory, Latin@ Critical Race Theory, Latin@ Cultural Citizenship and Chicana feminist epistemology theoretically ground her work while also helping to center the narratives of Latin@ immigrant parents. She hopes that the narratives of Latin@ immigrant parents will help highlight how oppressive institutional policies create barriers for authentic engagement within schools. Other research interests include family/community/school relations/relationships and family engagement policy initiatives (local, state, and federal level). Scribner, S.M.P. & Fernández, E. (2013). Leading with Latin@ Immigrant Parents. UCEA Review, 54(3), 20-22. Scribner, S.M.P. & Fernández, E. (Accepted). Queríamos algo bueno…para nuestros hijos y también para nosotras:A Freireian Analysis of Organizational Narratives of Latino Parent-School Engagement. Journal of Latino – Latin American Studies. Chesnut, C., Fernández, E., Decker, J.R., & Eckes, S.E. (2013, Nov.). Current Issues in Special Education Law for School Leaders. Panel presented at the annual conference of the University Council for Educational Administrators (UCEA). Indianapolis, IN. Fernández, E. & Scribner, S.M.P. (2013, April). Juntos Pero No Revueltos: A Latin@ Immigrant Parent Group’s Reflection on their Emerging Leadership Roles within an Urban Elementary School. Poster presented at the 2013 Robert G. Bringle Civic Engagement Showcase and Symposium (CESS), Indianapolis, IN. Fernández, E. (2012, Nov.). Deconstructing the Dominant Historical Narrative of Latinos in the Midwest: Illuminating the Latina Experience. Paper presented at the annual conference of the History of Education Society (HES), Seattle, WA. Fernández, E. & Scribner, S.M.P. (2012, May). Somos los que más sufrimos: Examining the Intersection of Anti-ImmigrationReform and School Policies on Latino Parental Engagement. Paper presented at the annual conference of Critical RaceStudies in Education, NY, NY. Fernández, E. (2011, Oct.). Solidifying a Subordinate Existence: Late 19th–Early 20th Century Southwestern U.S. School Curriculum/Practices and the Mexican/Mexican American Student. Paper presented at the annual conference of the Organization of Educational Historians (OEH), Chicago, IL. Maxcy, B., Scribner, S.M.P. Guajardo, F., Guajardo, M.A., Fernández, E., et. al. (2013, Nov.). “Education for What?”: A Critical Conversation with Engaged Community Organizers. Panel presented at the annual conference of the University Council for Educational Administrators (UCEA). Indianapolis, IN. Scribner, S.M.P. & Fernández, E. (2013, Nov.). Examining the Intersection of Anti-Immigration Reform and School Policies on Latin@ Parental Engagement. Paper presented at the annual conference of the University Council for Educational Administrators (UCEA). Indianapolis, IN. Scribner, S.M.P. & Fernández, E. (2012, Nov.). “Venimos… para que se oiga la voz porque si no hablamos nadie nos va a escuchar”- Lessons Learned From Immigrant Latin@ Parent Leaders in an Urban Elementary School. Paper presented at the annual conference of the University Council for Educational Administrators (UCEA), Denver, CO.
Scribner, S.M.P. & Fernández, E. (2012, April). Queríamos algo bueno…para nuestros hijos y también para nosotras: A Freireian Analysis of Organizational Narratives of Latino Parent-School Engagement. Paper presented at the annualconference of the American Educational Research Association (AERA), Vancouver, B.C., Canada.